In this study, we showed proof-of-principle experiments to demonstrate a printed organic inverter-circuit-based enzyme sensor with an extended-gate electrode with a lactate oxidase (LOx) and Prussian Blue carbon-graphite ink active area for the first time to inform users of an L-lactate overlimit concentration via a simple integrated electrophoretic display. The two-stage organic inverter circuit exhibited an abrupt shift in output voltage depending on the potentiometric sensor signal imposed on the constant input voltage of the inverter circuit, resulting in a distinct color change of the display connected to the output line of the inverter circuit. The L-lactate concentration limit was tuned by changing the input voltage of the inverter circuit. This new type of wearable biosensor, notifying the user of an overlimit condition, can arbitrarily be tuned by professionals such as medical doctors or sports trainers and would be helpful for users who do not have sufficient knowledge about the detected biomarkers. 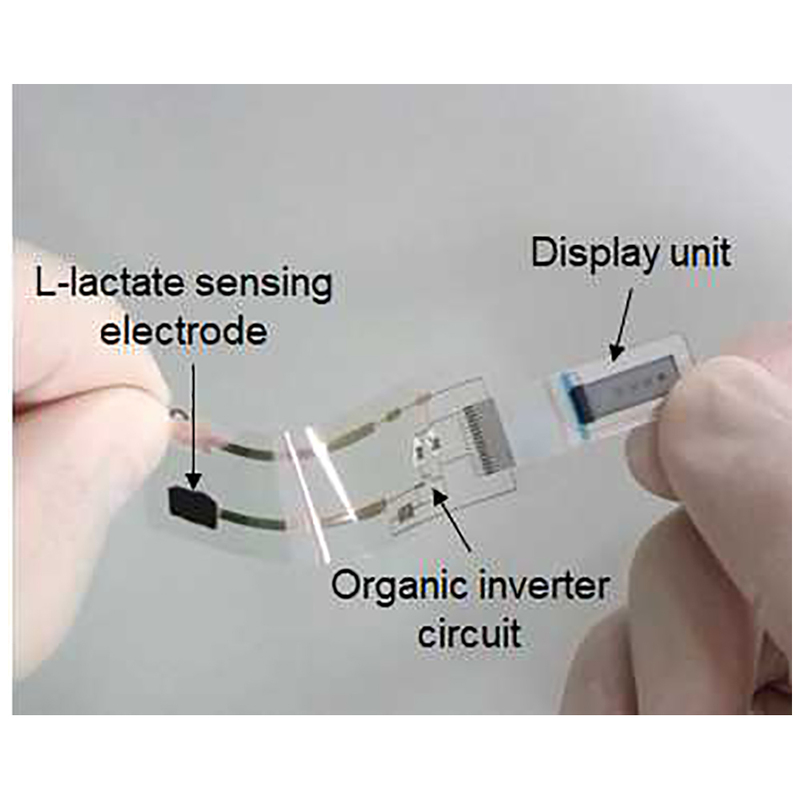 Kuniaki Nagamine, Taisei Mano, Rei Shiwaku, Hiroyuki Furusawa, Hiroyuki Matsui, Daisuke Kumaki, and Shizuo Tokito, An L-lactate Biosensor Based on Printed Organic Inverter Circuitry and with a Tunable Detection Limit, Sens. Mater., Vol. 31, No. 4, 2019, p. 1205-1213.